Thanks to these organizations and their active commitment to changing lives right here in south central Indiana! 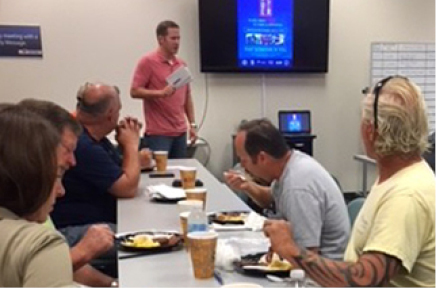 Hoosier Energy employees pulled out all the stops – including a chili cook-off -- to raise $5,796 and help those in need. The dedicated members of the South Central Indiana Kiwanis Club generously donated $2,000 to support local people. Matching donation opportunities could double your contribution! New gifts and qualifying increases can be fully matched. Click here for more info. Wow! Our THANKS to The Greater Bloomington Chamber of Commerce family! The Board of Directors enthusiastically responded to Campaign Cabinet member Vanessa McClary’s call to dig deep and give generously as they Passed the Pig. And the HYPE (Helping Young Professionals Excel) crew answered the call from Moriah Merkel-Sowders, Young Leaders Cabinet Co-Chair, to contribute at their recent gathering. A big THANKS to everyone who contributed and is fighting for our community! "The United Way helps fund vital services for community members and some working families that have fallen on hard times through no fault of their own. Help for the elderly, the physically and mentally challenged, at-risk youth and families in need of food, housing and healthcare are made possible by allocations from your local United Way." We appreciate the support of community members like Jackie Yenna, president of the White River Chapter, Southern Indiana Regional Labor Council, AFL-CIO. 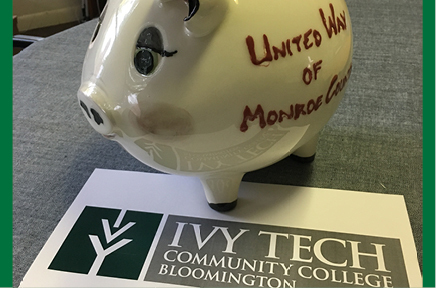 Thanks to Ivy Tech Community College-Bloomington for Passing the Pig and raising funds for United Way and our member agencies! Would your org like to #PassThePig for United Way? 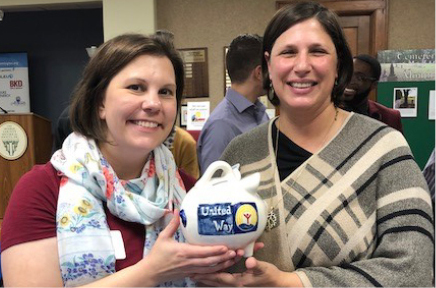 Thanks to German American Bank for hosting us at their United Way campaign kick-off event (which included a family-friendly chili cook-off --- YUM). Amy Stark from member agency Girls Inc. of Monroe County shared how they teach girls critical skills for success through their lives and about the partnerships and collaboration in the United Way network. 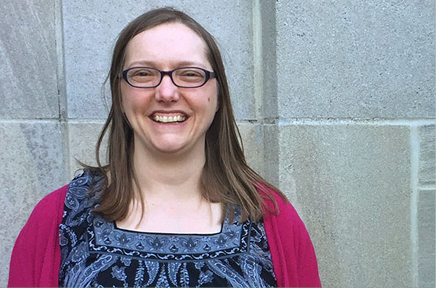 Our heartfelt appreciation to Jane Michi, Indiana University team member and long-time United Way supporter. Read her full story here. Take a moment to revisit the Indiana University-Bloomington campaign kick-off held in late September. "United Way helps everyone be the best version of themselves. As a youth, I needed opportunities like United Way presents. We were stacked up against the odds. But you can rewrite someone's legacy by giving to United Way." ~ IU Head Wrestling Coach Angel Escobedo. 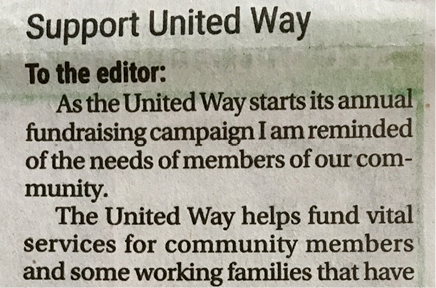 "Together with United Way we assure these supports are all in place, and we ask for your support in this work. Your gift touches one in three lives locally." We appreciate the partnership and support of our network of member agencies. Check out their recent Letter to the Editor in The Herald-Times. We so appreciate Erin Predmore, CEO, for including United Way’s Community Campaign kick-off in The Greater Bloomington Chamber of Commerce Annual Meeting and Community Awards. Chamber members care! A huge THANKS to outgoing board President Tony Stonger for kicking off Pass the Pig, Mayor Hamilton for making the first contribution, and everyone who joined in a round of Pass the Pig raising $608 to fight for our community! We’re excited to share that this donation to the Community Action Fund will leverage a deeper impact as is eligible for a 1:1 “Match to Win”! We appreciate the Vectren Corp team hosting our director Efrat Feferman and member agency Community Kitchen Volunteer Coordinator June Taylor on Friday morning as they launched their United Way workplace fundraising campaign. Goooooooo, Vectren! “There’s never been a better time to join or to step up your support. 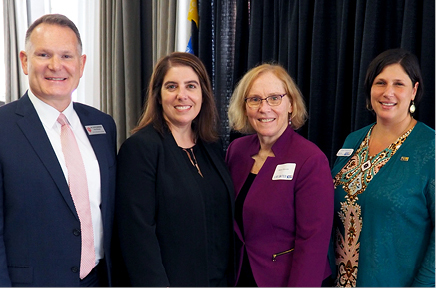 Let’s show, through our action, what it means to Live United.” With this inspiration, Isabel Santner, Partner at BKD CPAs & Advisors and United Way of Monroe County 2018-2019 Campaign Cabinet Chair kicked off the fall fundraising campaign! Thanks to everyone who joined us at the kick-off event and THANKS to everyone who will Give, Advocate, and Volunteer in the coming weeks to ensure everyone in Monroe, Owen, and Greene counties has the opportunity to learn more, earn more, and lead a healthier, safer life. Staff at United Way member agency Area 10 Agency on Aging raised $2,391 to support neighbors of all ages and stages. Bill C. Brown and Associates’ support of $1,000 goes a long way with United Way. BKD employees are getting results where it counts, with $5,825 donated for our friends and neighbors in need. Our friends at Catholic Charities, a United Way member agency, are dedicated to enhancing the quality of life for all with their generous donation of $455. The dedicated public servants of the City of Bloomington raised $10,291 towards a stronger community. Federal employees in our region not currently furloughed have generously donated $2,634 to those in need through the Combined Federal Charities campaign. The dedicated employees at member agency Community Kitchen generously contributed $3,009 to assure our neighbors have the supports they need to stay safe and healthy. Cummins and its employees generously donated $29,400 to make sure everyone has access to education, earnings, and the essentials. Great West Casualty is working to ensure a bright future for our community with a donation of $5,325 from employees. 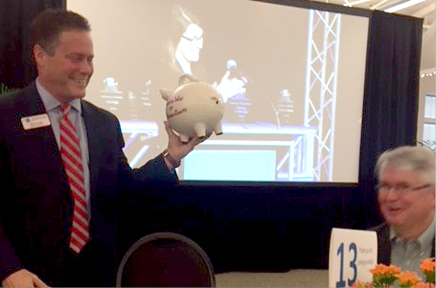 The entire Greater Bloomington Chamber of Commerce family, including annual meeting attendees, hYPe members, and the Board of Directors, enthusiastically dug deep and gave generously as they Passed the Pig to raise a total of $1,189 for the community. Golden Hands Construction employees are building a better future for our community with $842 raised. 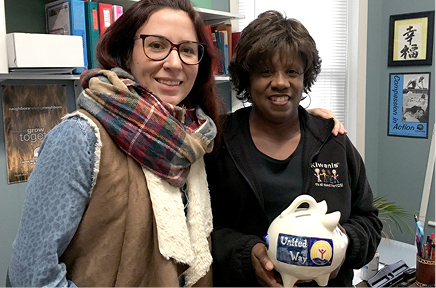 The dedicated staff at Indiana Legal Services, a United Way member agency, generously donated $4,540 to this year’s campaign, surpassing last year’s efforts to support fellow agencies. 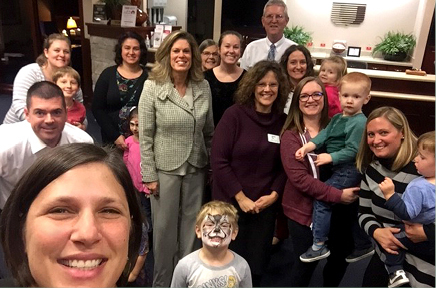 Community-minded IU Credit Union employees invested $19,452, in addition to a corporate gift of $20,000, for a total of $39,553 in support of resources to meet the needs of 2-1-1 callers and many more. The caring team at Monroe County Community School Corporation invested $3,458 in our future, in addition to the work they do, day in and day out! Monroe County Government employees are continuing their service to the community by donating $4,471. Old National Bank donated $13,263, including an $8,000 corporate gift, to help neighbors in need. PepsiCo is adding fizz to the campaign and helping to improve the lives of our neighbors with $1,080 in donations. Printpack employees wrapped up their giving campaign with $1,248 in individual and corporate donations. The caring team at Richland Bean Blossom School Corporation are making an impact well beyond the classrooms with donations of $2,498. The small but mighty team at member agency Salvation Army is committed to supporting our most vulnerable with their donation of $210. Staff at United Way member agency Stone Belt generously contributed $4,687 to help all those in need. Did you know that in Indiana, last years survivors made 142 requests for services on a given day -- including emergency shelter, housing, transportation, child care, legal representation, and more -- that could not be provided because programs did not have the resources to provide these services. $5 per week provides 17 hours of legal advocacy for survivors of domestic abuse to protect them and their children in the future. Did you know that in Monroe, Owen, and Greene counties, 12% of the population lacks health insurance? Without health insurance, preventative care and early intervention for individuals’ medical issues is more likely to be neglected, and individuals are at higher risk of a medical emergency leading to financial crisis. For those with insurance, but of low income, gaps remain in coverage and affordability, such as with dental care. $10 per week ensures that 1 person in need receives a full set of dentures to improve confidence, employment opportunities, communication skills, independence, and overall hygiene. Did you know that children who attend high-quality preschool are more likely to succeed in school, graduate, and earn as much as 60% more over a lifetime. At the same time, parents with reliable childcare are more likely to keep stable employment and increase their economic situation? $250 per week provides a family in an economic crisis with a year of licensed and accredited childcare that will help their child developmentally and ensure they can focus on rebuilding and stabilizing their lives. Did you know that low-income students are 4x more likely to be chronically absent from school, often for reasons beyond their control such as unstable housing, unreliable transportation, or a lack of health care? $1 per week ($52 annually) provides a child in need with new shoes and a winter coat keeping them warm and allowing them to full participate in school. Did you know that nationally and locally, about 15% of seniors face the threat of hunger on a daily basis. Isolation and transportation barriers further exacerbate lack of access to healthy food, yet proper nutrition is essential to maintaining basic needs such as digestion, efficacy of medications, and mental cognition. $20/week ensures that 10 local homebound seniors receive a nutritious, home-delivered meal each week. Did you know that on average, individuals with developmental disabilities are more medically fragile than their peers without disabilities, and their access to medical services is more restricted due to lack of financial resources and shortages of health providers that understand special needs and accept Medicaid. $1/week translates into a holiday party that provides Stone Belt clients living with disabilities an opportunity to engage socially. Did you know that quality after-school and out-of-school programs not only help working parents stay on the job, but also that children enrolled in such programs are more likely to come to school and stay in school, more likely to hand in their work, and more likely to get better grades. $5/week provides a youth with one-on-one after-school tutoring to help them enjoy learning and succeed in life. Did you know that more than forty million adults and one in five children in the United States suffer from a mental health disorder? Research tells us that toxic stress – stress caused by long-term, persistent factors such as mental health issues, extreme poverty, family violence, and abuse or neglect – can affect the architecture in the developing brain of a child. $50 per week allows Catholic Charities to provide intensive in-school counseling services for an at-risk child and their family for a full school year. Did you know that 50% of Hoosiers don’t have emergency savings to buffer against unexpected financial shock, which threatens both personal financial stability and affects the economy as a whole? Last year, 3,000 at-risk community members – 40% of them children, seniors, or people with disabilities – were provided housing assistance by United Way member agencies. This enabled those families to maintain a foundation of stability as they worked toward financial security. Additionally, 87% of people in programs designed to help them recover from crisis and get back on their feet made measurable progress towards self-sufficiency. 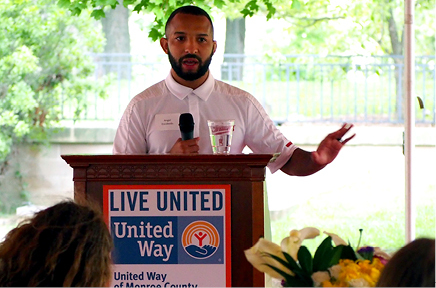 One strategy United Way rolled out on a pilot basis this year was a financial coaching program, which paired individuals with a year of free professional services personalized around their starting point and their identified goals. Six months into the program, the eighteen participants increased their savings by an average of $333 and paid off an average of $946 in debt. $3 per week can provide a person with a new job 6 months of bus transportation to get to and from work. Did you know that 42% of kids in Monroe, Owen, and Greene counties qualify for free or reduced lunch at school? Not only is this an indicator of poverty in our region, children facing hunger are more likely to struggle in school and have more social and behavioral problems? Last year, United Way member agencies provided over 1.7 million meals and 187,000 bags of groceries – a majority of these going to children and elderly residents. 84% of parents with children enrolled at member agency preschool programs reported an improved financial situation because of free or sliding-fee scale childcare. 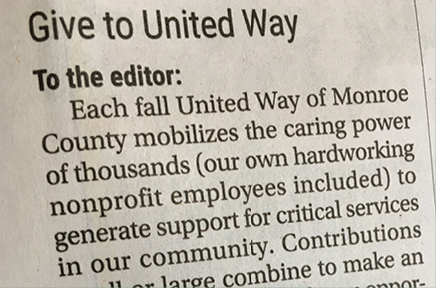 United Way of Monroe County joins forces with other United Ways to advocate and collectively fight for state and federal legislation that will support our most vulnerable community members. Also, United Way’s Free Community Tax Service helped local low- and moderate-income residents file 2,824 federal tax returns, bringing back $2.9 million in refunds and tax credits. Clients reported using those funds to pay for food, clothing, bills, rent, and to put toward savings. $3 per week can provide a family of four who is struggling to make ends meet with weekly groceries and nutrition classes for a year helping them get back on their feet. Did you know that high school graduates earn $700,000 more in a lifetime than a non-graduate? Last year, United Way donors helped ensure that 94% of high school seniors in mentoring programs at member agencies graduated on time, and 91% did so with plans to attend vocational school or college. 4,435 youth in our community were paired up in mentoring relationships or high-quality after school programs designed to help them succeed throughout life. United Way early reading programs distributed 8,000 books to our youngest learners, helping them build literacy skills and a lifelong love of reading that will put them in the path for graduation and take them far in life. Your donation of $5 per week can provide one-on-one after-school tutoring for a youth, helping them to succeed and enjoy learning. Did you know that 2-1-1, the around-the-clock hotline for information and referral services supported by United Way, last year responded to 3,752 inquiries from Monroe, Owen, and Greene counties and made 5,138 referrals to area services? Most callers were seeking help with housing, health care, utilities assistance, and food. The top circumstances for their need? Callers reported an illness or disability, a reduction in income or hours, or unemployment and lay-offs as the top three reasons for their call for help. A donation of $1/week provides advice to two Indiana Legal Services clients about tenant rights and responsibilities, ensuring they are treated fairly by landlords and the judiciary, and fulfilling their contractual obligations. See Campaign Highlights from previous years.